File Under “Things That Were Just a Matter of Time.” New scams using Affordable Care Act to harvest personal information. Okay, so if you live in these United States, you may have heard of a controversial little thing called the Affordable Care Act. Yeah, okay, before you head to the bottom of the page to sound off, I’ve already turned comments off for this post. I’m not here to express my opinion of the legislation, and I’m not fielding others’, either. Our opinions are irrelevant for the moment. Besides, certain post topics generate TONS of bot-generated spam comments, and I have a hunch this might be one of them (you should’ve seen how many came in when I wrote about Açaí berry scams a few years ago…it was seriously ridiculous). And, as a Thing That Exists, it was only a matter of time before someone started up a scam based upon it. That sums it up pretty nicely, both in this specific instance and as a general rule. 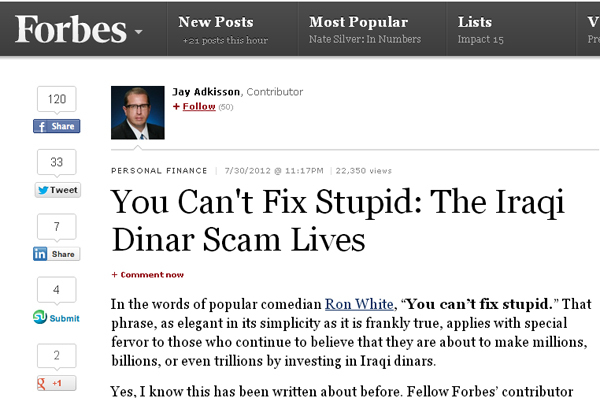 First, let me go on record here: I disagree with the author’s use of the word “stupid” in the title of this article. It’s arrogant. Falling for a scam doesn’t make you stupid; it is my deeply-held belief that everyone is vulnerable to scams. Every single one of us has some magic combination of situation, emotion and opportunity capable of leading us straight into Scamsville. My goal with this site has always been to eliminate as many of those possibilities as possible; to make your own scam-combination-lock as difficult to decipher as possible. But we’ve all got a tell. Somewhere. I can’t emphasize this enough. But this particular scam isn’t really my focus here. 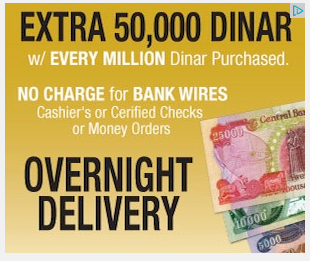 Yes, the Iraqi Dinar Investment Thing is very much a scam. The fact that entities selling it have to classify their businesses as a service for collectors of exotic currency (and not as a foreign exchange investment) to get around regulations should tell you something. Now you know. Go forth and tell others. Yep. An advertisement for a business involved in the very scam the article spends several hundred words discussing. No, I didn’t click on it. I don’t trust these businesses enough to even expose my computer to their websites. So I can’t give you any further details on this particular “offer,” but I can assure you: it involves you paying a few thousand dollars for a mound of paper that’s going to be worth the same nothing ten years from now that it’s worth today. So here’s your takeaway for this Friday: for the most part, just don’t click on advertisements that appear on websites, even when those websites are reputable (I mean, Forbes wasn’t exactly founded a week ago, you know?). Even if the ads seem relevant to what you’re reading. In fact, lots of web browsers now have plugins available that will block banner ads from view altogether. Adblock for Google Chrome is popular. I used it in the past, but since I have to occasionally write articles on this stuff, I felt it was better for me to be able to see the ads. There was even a variant called “Catblock” at one point, which replaced ads with pictures of totally adorable cats. Which is just awesome. We’ve got a full line of scams and rip-offs here: car dealerships rolling back odometers, shady mortgage schemes, the grandchild-in-trouble telephone scam and a few Craigslist rental property scams. The articles above do a fine job of presenting the details of each situation; no need to rehash here. The real lesson is this: always be aware of potential scams, watch out for anyone promising to lower your mortgage payment, never take an online classified ad at face value, never wire money to anyone who contacted you first, and always get a Carfax report before you buy a used auto. The bad guys are out there, and they have a variety of methods at their disposal. All the rest of us can do is be informed, ask questions and stay vigilant. But those simple tools go a long way towards keeping yourself away from scams and fraud. When you read about as many examples of scams and identity theft as I do, you start to notice patterns. Even though the details may change, most scams are based on one of a few tried-and-true structures. This actually makes it easier for you to avoid them, however. Instead of learning the minutiae of every new con job that comes down the pike, you can apply a few basic principles to steer clear. One of those principles is similar to “Who Initiated Contact,” which I wrote about several months ago. This time the question is, “Did you take action that would lead to this transaction?” Here are a few examples. Lottery scams always seem to come up, but people still fall for them, so a little refresher never hurts. With a normal, legitimate lottery, you begin the transaction by purchasing a lottery ticket. You then wait for the numbers to be called. If you win one of the big prizes, you take action again by contacting the lottery office, presenting the ticket, filling out paperwork. If you don’t take this action, they might know when and where a winning ticket was sold, but they won’t contact you. Lottery scams don’t start with action on your part. Out of nowhere, someone emails you and informs you of a lottery you’ve won. It’s the exact opposite of how a genuine lottery works. The rest of the scam runs in similar bizarro-fashion, with the victim sending money, but if you stop to think, “Did I take action that would logically lead to this?” first, you won’t even bother to get that far. Employment scams come in all shapes and sizes, and their objectives range from taking your money outright to leaving you as the only traceable, domestic link in a money laundering scheme. However, most of the time, when you find a new job it’s because you took some action first. You filled out an application, sent a resume, networked with people in the industry. You probably didn’t just wait for a job to fall on your head. Employment scams often don’t wait for you to take action. You’ll get an email that claims you’ll make hundreds of dollars per day. You’ll be “hired” without an interview or application. Pay is often wildly out of proportion for the work you’ll supposedly be performing ($10 to stuff an envelope, for example), which is another way to apply the question of whether you took action; would any employer in their right mind pay you over a hundred dollars for less than an hour’s worth of mindless work? There is a caveat here, though: not all employment scams can be weeded out this way. If you’re actively looking for a job and posting resumes on job websites, you’re taking action that could lead to employment opportunities (post a resume on Monster.com and see how many work-at-home “payment processor” jobs (i.e. money laundering) you’ll be offered via email, sometimes within an hour). To further complicate matters, fraudulent companies often post fake listings on job sites, so you might be tricked into sending your resume to them first. Always research any company before you apply, but also remember that high-paying job offers don’t just fall out of the sky. A scam recently surfaced in Virginia that targets homeowners who are underwater or in foreclosure. It starts with a phone call that tells victims they are owed money from a federal mortgage settlement and ends with the victims revealing bank account numbers in hopes of receiving a check, only to be remotely cleaned out by crooks. The scam is based somewhat on fact—there was a settlement with mortgage lenders meant to make good on bad foreclosure practices—but those eligible still have to take action first. Applications and other paperwork have to be filed, and the homeowners have to be the ones who start the process. Asking “Did I take action that would lead to this?” isn’t the only method to spot a scam, and as noted above, it’s not always the best test, but it’s a good weapon to keep in your arsenal for the next time a possible scam shows up on your radar. Crooxting? Because they’re crooks, and they’re texting you. Something tells me this is going to be an uphill endeavor. Sort of like trying to make ‘fetch’ happen. I’ll give you a shiny new penny* if you can find five things that DON’T scream “absolute scam” about this, because I sure couldn’t. I also won’t be texting ‘stop’ to anyone, either; I don’t want to confirm that mine was a genuine phone number. If you get one of these, just delete it. *Disclaimer: Not a genuine offer. I don’t have a shiny new penny. Which is making this Penny Racer totally unfun to play with, by the way. No wheelie action at all. Among fans of Justin Bieber, getting the popstar to follow you on Twitter is apparently a badge of extreme OMG-ness, which means it was inevitable that a scam would surface exploiting the fact. If you even mention the star on Twitter, there is a good chance someone will direct message you with a URL that supposedly reveals a surefire way to get the star to follow you back. It then leads you to a site that requires a cell phone number and for the victim to take yet another bogus IQ test. What happens next: the victim’s phone is charged $10-$20 per month for some lame premium service, and Justin doesn’t follow them at all. As of the latest reports, the original scam site had been shut down, but it won’t be long before it resurfaces. Warn the kids: anyone on Twitter that tells you they have a way to get a star to follow them back is leading them into a scam. Also, in a year when there’s some new pop culture obsession, just take out the words “Justin Bieber” and fill it in with the Current Big Thing, and repeat the warning. A guy in coveralls will hang around a parking lot and wait for an elderly person to go into the store. He’ll then dump some oil or brake fluid near the car. When the potential victim returns, he’ll tell them he’s a mechanic and that he can fix the car. One he “fixes” the non-existent leak, he informs them he has to charge for the “service.” I would assume they get a bit aggressive if the victim refuses. If someone in a parking lot offers you auto repairs out of the blue, politely refuse. Take your car home and park it. If there’s a (new) pool of fluid a few hours later, your car really does have a problem. Take it to a real mechanic you trust. But there probably won’t be, because in all likelihood you were approached by a con artist.